The news comes from straight from the mouth of Bob Gale, who co-wrote the original series with director Robert Zemeckis. The two will pair up again for the staged version, which should arrive in London next year. And yes, "The Power of Love" will be on the playlist. We know the integrity of the material will be preserved in a production that will be a wonderful companion to the Trilogy. 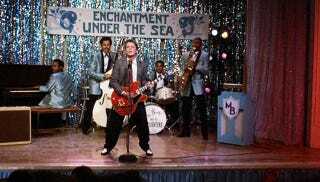 We intend to use music from the movie along with brand new songs to make a version of Back to the Future that is fresh, entertaining, and takes advantage of all the amazing things that can now be done on stage. If you're concerned about another Spider-Man: Turn Off the Dark debacle, well, good! You've been paying attention to the high-profile movie-tie-in musical game. But the team bringing BTTF to the stage is the same that transformed Wicked and Billy Elliot from a beloved book and movie (respectively) into Broadway success. So there is hope!